Cross shaft fragment with the remains of two panels, front. There is a plain band below the lowest panel. The sides of the shaft have cable-moulding. The lower panel shows two men on horseback fighting with spears. The horses are small. The men are dressed alike, with both their clothing reaches to their ankles. 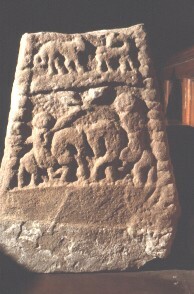 The upper panel has two quadrupeds.